Bring On The Fall Floral Color Pallettes! Autumn doesn’t have to be all orange, yellow and red. 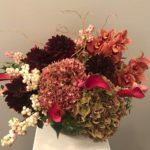 We are so ready for the fall color palettes and flower varieties!